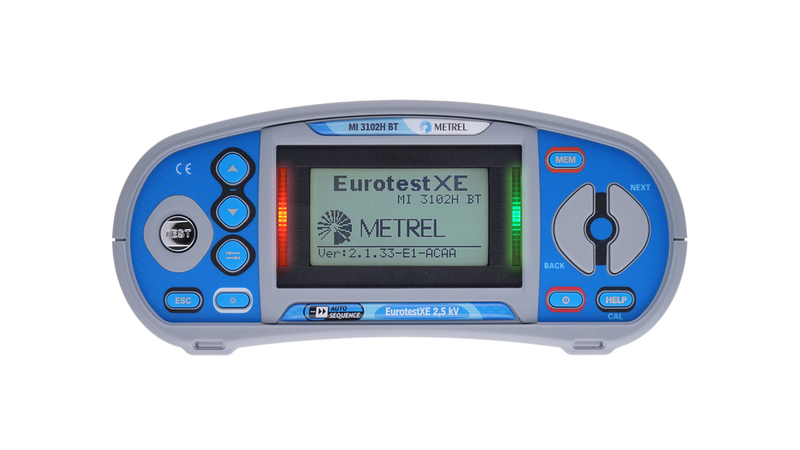 MI 3102H BT EurotestXE 2,5 kV is a multifunctional measuring instrument which apart from all the necessary functions for complete installation safety testing according to IEC/EN 61557 performs insulation resistance measurement with the test voltage up to 2,5 kV (measuring range is up to 20 GOhm) and enables diagnostic test by PI and DAR indexes calculation. Besides, the MI 3102H BT EurotestXE 2,5 kV enables on-line voltage monitoring, phase sequence testing, earth resistance measurement, illuminance measurement and TRMS current measurement. EurotestXE 2,5 kV is equipped with integrated characteristics of fuses and RCDs for PASS / FAIL evaluation of test results. All the results can be quickly saved and referenced on the instrument and then downloaded via the EuroLink PRO software (included in the standard set) to the computer for evaluation and report generation after testing.